It is hardly bigger than a matchbox and yet there is a laboratory en miniature on this chip. Single bacterial cells grow in about 2000 channels of a thousandth of a millimeter in diameter and can be individually studied in detail by the researchers in Prof. Erik van Nimwegen's group at the Biozentrum, University of Basel. By recording thousands of microscopic images at short time intervals, the precise growth and behavior of many generations of individual E. coli bacteria can be tracked over several days. The huge amount of raw data generated is automatically analyzed, and precisely quantified by new image-analysis software called MoMA. The software was developed in collaboration with scientists from Prof. Gene Myers' research group at the Max Planck Institute of Molecular Cell Biology and Genetics in Dresden. 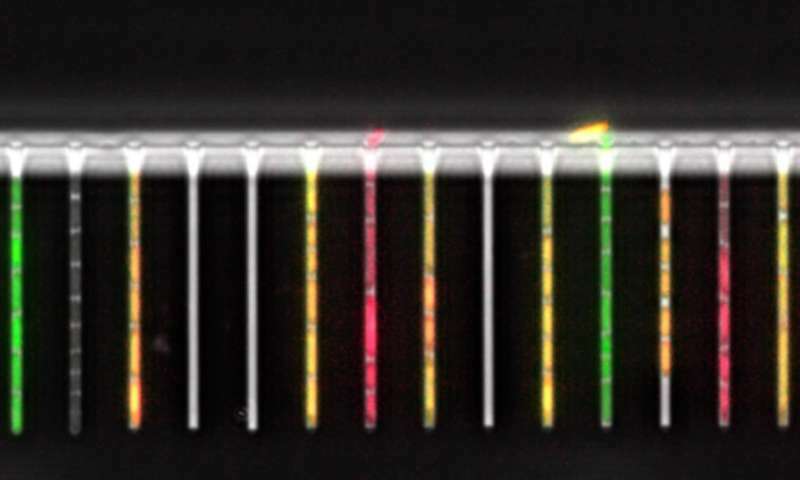 "With the microfluidic chip we can also answer, how bacteria communicate with each other, how they respond to stress or whether the relationship of bacterial strains plays a role in adaptation strategies," says van Nimwegen. "Such single-cell analyses are very important, because measurements of entire cell communities are often misleading since all the heterogeneity of the the single cells has been averaged out." The researchers demonstrated the efficiency of the chip laboratory using a model system of gene regulation, the Lac-Operon. "We have used green fluorescent protein to observe how E. coli bacteria respond to alternating nutrient changes from glucose to lactose. The Lac-Operon has been studied for more than 50 years, and still, we discovered new important properties when looking at it with single cell resolution," says van Nimwegen. In the first round, the bacteria switched to lactose turnover with a time lag. However, repeated switching from glucose to lactose led to a much faster adaptation of the cells as they started growing much earlier. "Surprisingly, the lag times are similar in genetically related cells suggesting that bacteria retain a memory of the behavior of their ancestors."